On October 4th, myself and a few others from the Master Toddy team were lucky enough to be able to attend Prison Fight. For those who aren’t familiar with Prison Fight, it’s is a charity event that puts foreign fighters up against Thai prisoners in Muay Thai and boxing bouts, which tours around various prisons in Thailand. You can watch a highlight video from one of their previous events here. 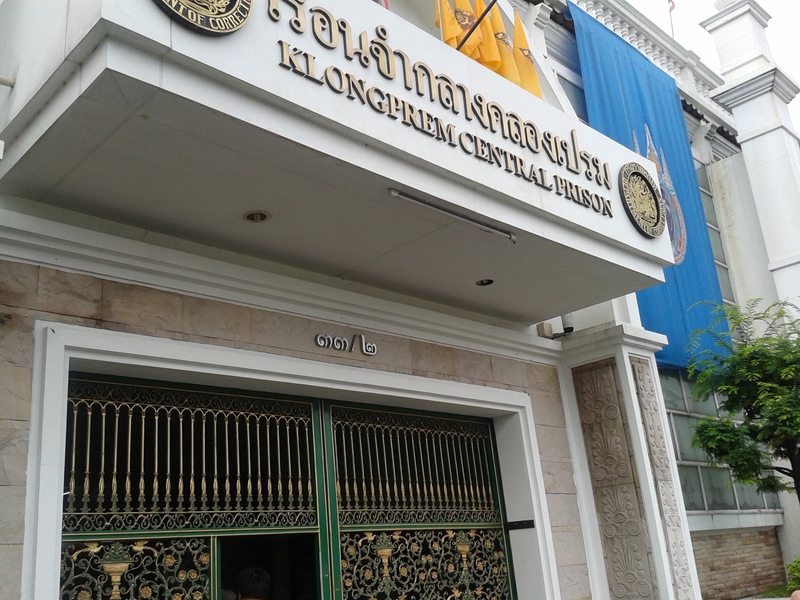 The latest one was the fourth, and was held in Khlong Prem Bangkok Central Prison. Khlong Prem is a high security penitentiary, which holds both male and female male inmates. I had previously tried to gain access to the show via various people, but was told that there was no way I could possibly get in, as prison security measures were of course very strict. However, after speaking with Master Toddy, he assured me that he would find a way. He saw that the legendary Diesel Noi Chor Thanasukarn was working with the show, and with that, he made it happen. Diesel Noi has made a few visits to our gym recently, one of which happened to be the day before the event. Sure enough, after a quick chat with Master Toddy, he promised to meet us at Khlong Prem the following morning and take us in with him as his guests. We arrived at the prison grounds to be greeted by Diesel Noi, and felt very lucky that he’d given us such a special opportunity. He led us through the looming metal gates, where we were then greeted by several prison guards. After signing in and going through security checks and searches, we were told to leave our belongings in lockers, as no mobile phones or money would be allowed into the prison grounds. While Klong Prem’s appearance seemed cold and unwelcoming, I was humbled by the warmth and hospitality that the prison officials showed us once we were inside, allowing us the sit ringside with them and providing us with food and drinks throughout the event. Clearly, we had arrived in the right company. As I scanned the area, I could see that it was a very limited event, available exclusively by invitation only. The only way to see Prison Fight, it seemed, was to be an inmate, a fighter, or to be working on the show. That, or to be with Diesel Noi! We had clearly been very privileged to be given access to the show. As well as Diesel Noi, there were various other great figures of Muay Thai present, including Pudpat Noi Worawut. Diesel Noi refereed some of the bouts himself, which he has also been doing for the Muay Thai Warriors shows quite recently. It’s great to see that he’s still so active in Muay Thai. There were nine bouts in total, six Muay Thai and three boxing. All bouts consisted of three rounds, with an extra round if required. I assume that this was for the purpose of keeping it interesting and action-packed, much like Thai Fight. As the first Thai fighter approached the ring, the stands erupted with cheers from his fellow inmates. The atmosphere of a crowd full of prisoners cheering for one of their own really is something to behold. He had a tattoo of a pair of boxing gloves on the right of his chest, and ‘KP’ (Khlong Phrem) shaved into the back of his head. He opened the show by performing a significantly long and beautiful ram muay, much to the applause and appreciation of everyone watching. Before the fight had even started, he was giving a great display of skill and balance (as well as cockiness), all while sporting a cheeky grin on his face. He was clearly very, very confident. That confidence continued into and throughout the fight that followed, and he out-classed his Scottish opponent, winning the fight by decision. Many of the fights that followed continued in the same fashion, and most of the Khlong Prem fighters overcame their foreign opponents, who were from various countries, including Japan, England, Ireland, Italy and the USA. However, two of the foreign contenders managed to defeat their opponents and take the Prison Fight belts home, one in a Muay Thai bout and one in a boxing bout, both winning on points. While the foreign challengers may not have been able to secure the majority of the wins, they showed a great deal of heart. How many fighters would be willing to go into a high-security Bangkok prison and go up against against one of the inmates? Regardless of their results, they had all taken part in something quite special. One of those fighters was Mark Sayer from Sitsongpeenong. I had previously met Mark while training in Chiang Mai a couple of years ago, before I had even begun fighting. It is quite amazing to see where our paths have led us since, and it makes me happy for them to have crossed again. When I asked Mark if the idea of fighting an inmate bothered him at all, he replied ‘yes, but not for the reasons you might expect’. He noted that there were some feelings of ambiguity surrounding the fight, describing the ‘appreciation from the crowd’, but mentioning that it was clouded by the thought that ‘the crowd is a bunch of people who quite possibly deserve to be behind bars’, considering that some of them were serving lifetime sentences. Interestingly, he also pointed out that although the idea of ‘Prison Fight’ sounds a little shady, it was actually ‘one of the most well-run fights in Thailand that he’d ever been to’. While watching the event, it was clear to see that Prison Fight was providing something valuable to Khlong Prem’s inmates. Prison Fight’s official website states that ‘the ultimate aim is to promote sport among prisoners and to help them quit taking drugs for better social adaptation in the future’. While giving any kind of privilege to convicted criminals may understandably stir controversy amongst some, I believe that it is ultimately a beneficial operation. The hellish conditions of Bangkok prisons are well-documented, and while prison life anywhere around the world may not be a bowl of cherries, it should provide not simply punishment but also rehabilitation, and Prison Fight is a good example of that. Working with the Department of Corrections, it provides training equipment, financial remuneration, and most importantly, something positive and productive to focus on. Taking part in an event like this can help prisoners to feel that they are part of something to which they are able to give a valuable contribution, and this can provide distraction from the rife drug-culture along with motivation to do something better for themselves. This is not the first time that Thai prisoners have been given the opportunity to ‘battle for freedom’. Female inmate, Samson Sor. Siriporn (Siriporn Thaweesuk), literally fought her way out of prison in 2007. I’ve heard mixed opinions on Prison Fight, with some even suggesting that it is exploiting the Thai prisoners. However, I should note that those opinions came from people who hadn’t attended the show. While I can see why it may seem that way on the surface, once you see it for yourself, it’s very different. This is not a ‘fight club’ where foreigners can fight prisoners just for the novelty of it. This is a very well put-together event where legitimate Thai fighters who also happen to be prisoners are given a chance to put their skills to use and work towards something better. All in all, I feel that Prison Fight is providing some exciting opportunities. While it’s a fairly new venture, with its first event in January this year, I’m hopeful that we’ll see more of their events in the future. With all of the harrowing accounts that we so often hear of Thai prisons, it’s great to see something positive happening behind those walls. Plus, it’s always fantastic to see yet another example of what Muay Thai can give to people. I was unable to take photos inside, but following are from the Prison Fight Facebook Page. This entry was posted in Fights and tagged Khlong Prem, Prison Fight. Bookmark the permalink. Hmm! Interesting, makes me wonder what’s the motive….. but that’s looking from a a negative standpoint. ..I guess everyone needs a second chance. I think its great! I think about how much Muay Thai changed my life so i know it can help these people too. How can I get my name down to fight?